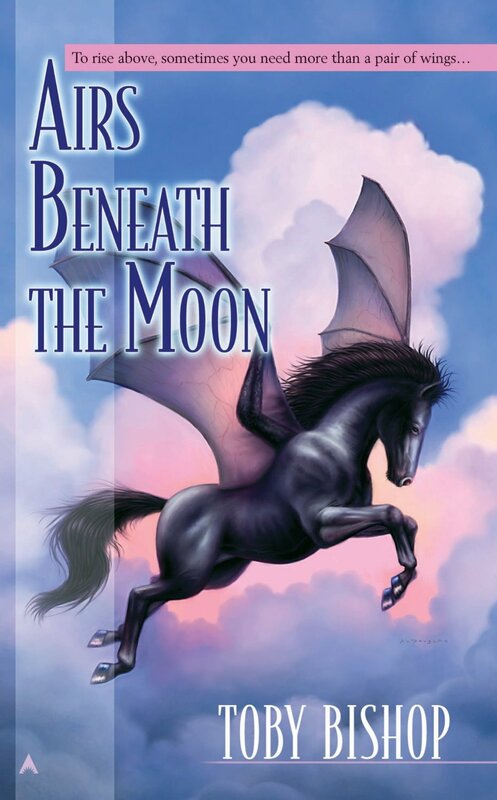 Airs Beneath the Moon is a story of the winged horses of Oc and the women and girls who fly them. The girls who bond with a winged horse spend six years at the Academy of the Air, training. Their bondmates are closer to them than any family member could be, and they devote their entire lives to them. But the son of the Duke of Oc, William, thinks men should also be able to fly, and he will go to any length to make that happen. "Bishop enables us to visualize the horses in solo flight and complicated formations, scenes at the academy are utterly real, and the characters have dimension. In short, this is a thoroughly satisfying read, fortunately with enough loose ends to justify a sequel." "This first in a trilogy about winged horses and the women who ride them does an admirable job of setting up an escalating power struggle. The main antagonist is the new Duke as he attempts to circumvent biology and time honored practices leaving the horsemistresses on the defensive. Strong character development, politics and magical horses all add up to what promises to be a lively and engaging trilogy."